Reprint of LEC #146, 14th Series, V. 6 in 1943. Front Binding – Happy Halloween! And it’s a new post from me at last. Today, let’s feature the German master of horror, Herr Hoffmann. This is a bit of a curio from the Club; E.T.A. 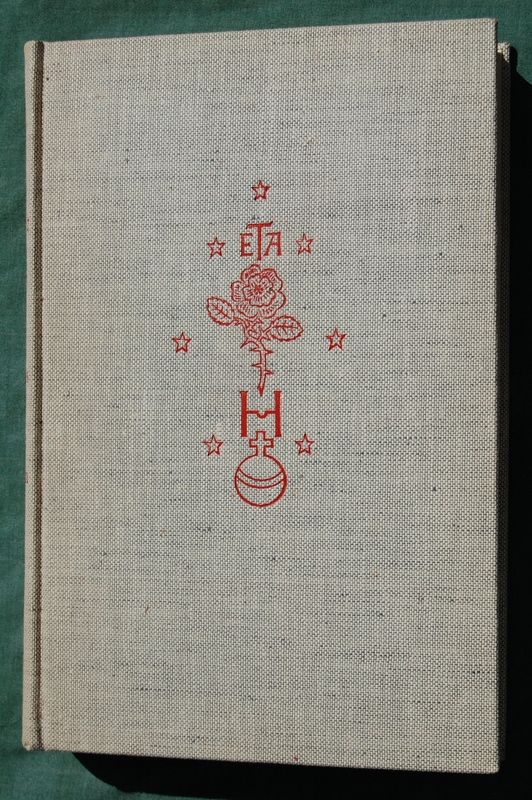 Hoffmann does not have the “classic” status of some of his contemporaries here in America, although according to Macy he was definitely well-regarded in his native Germany and even noted that a reader of Hoffmann would be consider having “a high I.Q.” This was the sole work from Hoffmann printed for the LEC and the Heritage Press. Hugo Steiner-Prag is not unfamiliar to this blog, unlike the author of this work; Herr Steiner-Prag has appeared multiple times. In fact, I believe that beyond the LEC Measure for Measure, we have now documented all of his work for the George Macy Company with this post. His short but storied run is documented on Tartuffe (which, after taking a quick look at that post, reminds me how much I need to clean up all those old posts). He is a great fit for the tense texts of Hoffmann, as you will see. Alas, this was his final work for either club, as he passed away during the production of the LEC edition of this work shortly after submitting his contribution. Design Notes – The designer is not mentioned in the Sandglass, but Django6924 alerted me that the LEC colophon mentions that Steiner-Prag was the designer. 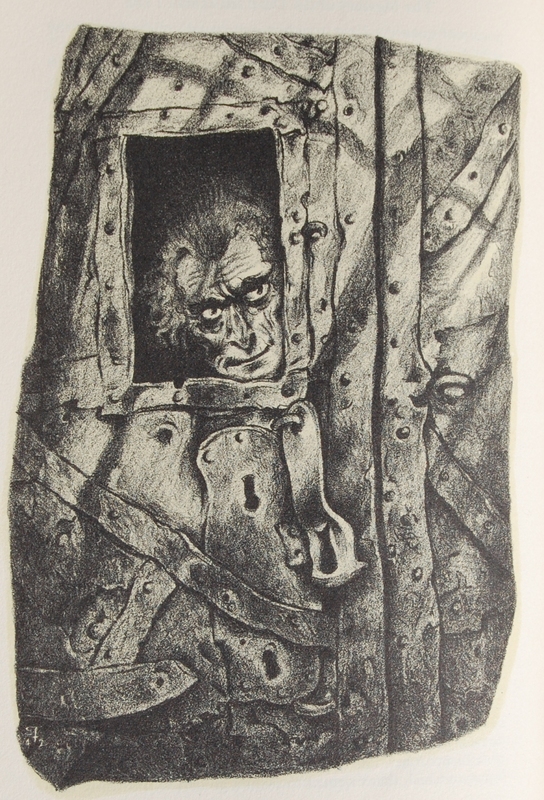 Steiner-Prag was “obsessed” with Hoffmann according to Django, and I think that his artwork, design work and prologue serve as a declaration of that obsession. The font chosen was Waverly, with Walbaum utilized for the headlines. Westcott and Thomson composed the type, and Ferris Printing Company handling the printing. 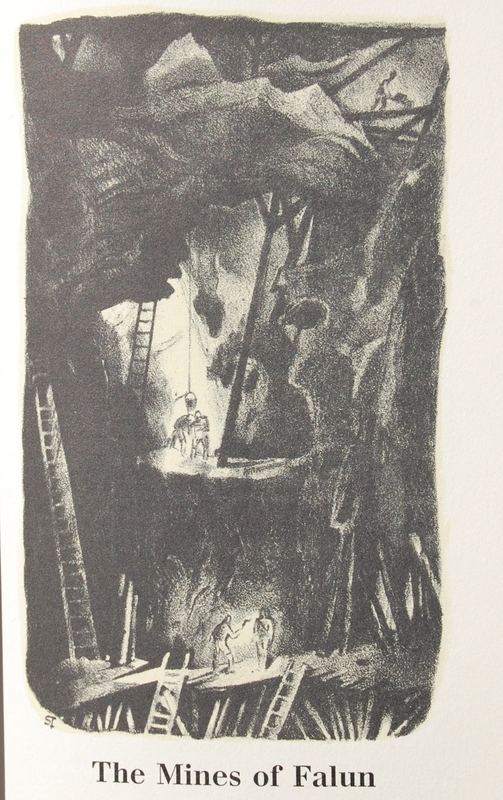 George Miller printed the lithographs. The paper is from Chillicothe Paper Company specially made for this edition (with a comment about its quality despite being in the middle of World War II). Russell-Rutter handled the bindery duties. Steiner-Prag composed the designs for the cover, which Macy observes may have been his final piece of art before his death. The cloth is a rough, blue-gray Dutch linen. Title Page – Steiner-Prag has the notable distinction of serving not only as illustrator, but as the introduction writer as well. This is a little unusual; I can’t think of another instance I’ve come across this in Macy’s tenure, as well as the later owners of the Clubs. 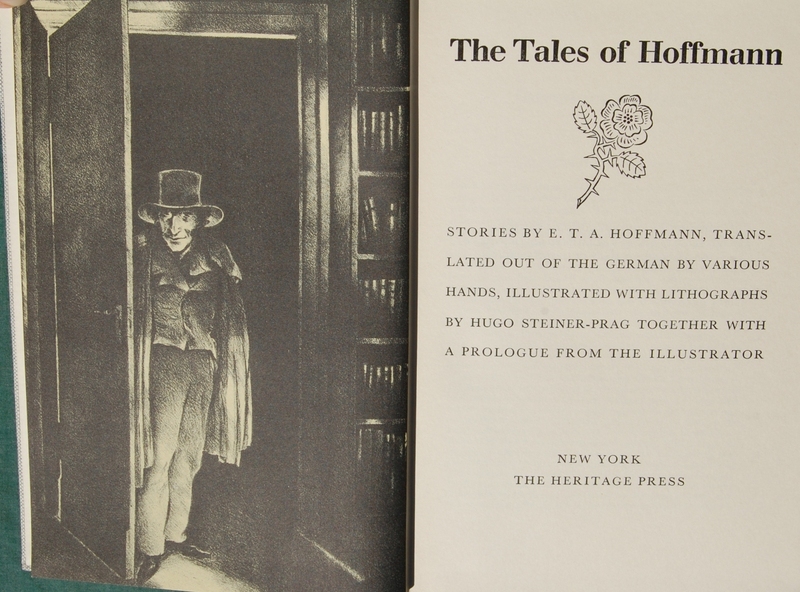 It’s also unusual in that Steiner-Prag decided to write his own tale instead of a literary essay; Django explains it as “the record of a ghostly encounter Steiner-Prag had with Hoffman. Strange, and much in the nature of one of Hoffman’s own tales.” So, this is certainly a unique volume in the annals of the LEC/Heritage Press canon. Page 35 – Steiner-Prag is a perfect fit for this. His expertise shines, and this may be his best work for Macy. Personal History – I picked this up from Second Time Around Used Books in Merced, CA while I still worked there. Since I left, there’s been an increase in Heritage titles there. Haven’t gotten around to reading the stories yet, but I am certainly intrigued. You are currently reading Heritage Press – The Tales of E.T.A. Hoffmann (1943) at The George Macy Imagery.